Home General News SAY NO TO PYLONS! ¡DI NO A LAS TORRES! THERE is a protest movement here in the South of Granada with a voice that is growing louder every day. It is a group of people with varied political beliefs and diverse backgrounds coming from many different nations. The platform DI NO A LAS TORRES EN EL VALLE DE LECRÍN is an inspirational group of people, standing up together for the good of the environment and for their livelihoods. They are fighting for their quality of life, communicating, delegating and integrating in a way rarely seen these days. The individuals have different ideas and perspectives but are united with a common goal and they all try to work together to oppose this project – the proposed and imminent construction of a sub-power station and an electric super-highway which is set to cut through the middle of the beautiful Lecrín Valley. The founders of the protest group first became curious when they heard rumours about a new plan, Lecrinnova, details of which were agreed in a meeting in Granada on 11th October 2018. This was signed by representatives of the company Red Eléctrica de España SA, the mayors of the 8 villages of the Lecrín Valley and the President of the Diputación de Granada. This handful of people must be applauded for their efforts, not only for bringing this virtually-secret project to light in the first place, but also for their continued energies. They have created a viable plan of action and have organised well-researched and well-written legal objections or alegaciones in Spanish, all prepared quickly in order to be ready to present during the limited period of time being given to object. The initial objection period of 30 days was extended at the end of last year, this not long after the project first came into the public domain. The first alegaciones were written hurriedly by the founders and advisors to the platform to be signed and presented by as many locals as possible. These alegaciones complained about the project’s lack of transparency, the failure by REE to consult in good time with interested parties on a local level. The Junta de Andalucia had also failed to make some of the documents available on their website at all. The platform, their supporters and others opposed to the project gained a little time but now only have until 7th March 2019 to write and present their own objections or adhere to and sign one of the prepared arguments against it. The members and supporters of the platform Di No a Las Torres in the Lecrín Valley are mostly people who were lucky enough to be born here, or those who have chosen to spend their lives and build their businesses in the Valley. They are also supported by the many visitors who have grown to love the area and who keep coming back. Their combined voices are becoming impossible to ignore as they fight against what they can only see as an impending disaster, one which promises to destroy this lovely valley and its unique environmental beauty, and endanger its flora and fauna. They can see that it will decimate the value of property in all villages of the Valley, some more than others of course, and devastate local businesses and the overall future economy of the area which is based mostly on rural tourism owing to its exceptional and relatively unspoilt beauty. They fear for their health and that of their children, understandably concerned about the potential harm that living in close proximity to such high voltage installations could cause. They feel angry that they have been kept in the dark about this project even though it had been in the planning stages for 7 years, upset they were not consulted or even considered in any of the decision-making process and demand to be heard now. They claim this as their right under Spanish and European law. The existing sub-power station in Órgiva is to be updated in the new Plan and new high tension cables planned to run from the Lecrín Valley to Izbor along below Lanjarón and then crossing the beautiful hills and valleys behind Órgiva. The lines then stretch through the Alpujarras to Torviscón, Fondón and close to many other villages on its path to Benahadux in Almería destroying many areas of natural beauty and tranquility. The many nationalities that have settled in this area are uniting and mobilising too for the battle. They are gaining more and more awareness and support and they too are presenting their alegaciones by the same date, 7th March 2019. Red Eléctrica de España S.A., has been contracted to install a high voltage line, dubbed here the “electric motorway”, with a sub-power station of 14000m2 to be built in the municipality of Saleres, El Valle but in fact just outside the beautiful village of Conchar, Villamena and a total of 108 pylons planned to march their way across 30km through the beautiful Lecrín Valley and so on through the equally lush hills and valleys of the Alpujarras in its 182 km journey to join El Fargue,Granada to Benahadux, Almería, making a total of 211 pylons. The pylons in the Valley will have an average height of 56m but some will be 79m tall. The distance between pylons will be between 400m and 800m and the cables must be at least 7m from the ground. Red Electrica Corporación S.A. is the parent company of the Group which controls Red Eléctrica de España S.A.U, (REE) which is responsible for electricity activities in Spain and owns all the corporation’s transmission and operation assets. The activity of REE accounts for 93% of the Group’s business. The other companies in the Group are Red Eléctrica Internacional S.A.U. (REI) which has holdings in Peru, Chile and Portugal, Red Eléctrica Infraestructuras de Telecommunicación S.A.U. (REINTEL) with a network of over 33,000km of fibre optic cables for telecommunications, Red Eléctrica Infraestructuras en Canarias S.A.U. to promote energy storage projects in the Canary Islands, Red Eléctrica de España Finance B.V. and Red Eléctrica Financiones S.A.U. to finance the various activities of the group and REDCOR Reaseguros S.A. created to reinsure risks linked to activities, and to guarantee better access to international markets. Despite the existence of several wind parks, the area still manages somehow to stay attractive to visitors and boasts some 8000 visitors every weekend in the Lecrin Valley alone. It is estimated that some 245 businesses are actively and directly connected to rural tourism here and that 60% of these have opened their doors just in the last 6 years. The locals have already tolerated the installation of a gas pipeline and face the prospect of the appearance of yet more windmills soon, but all feel that the installation of the sub-power station in Saleres and the grids of power lines and pylons stretching off into the horizon in every direction would change the valley irrevocably and destroy any future prospects they may have at all. The REE seeks to assure the local community that the proposed project will be an asset to the community, that the installation is essential to ensure a secure electrical supply to the region and to transport renewable energy from the many windmills we already have here and those that are yet to be installed in the near future. They insist that there is a desperate need for increased power in the grid and that they expect our electric energy demand to grow even though the figures for electricity consumption have gone steadily down over the last few years and Spain produces at least twice as much power as it needs. They also claim that its construction will employ many local people and that it will have a positive impact on the area and its community. The locals and the platform Di No a Las Torres believe this all to be untrue. They dispute the claims for increased electrical consumption in the region and point out that we already produce more than twice as much electricity as we need in Spain. They see the power lines and the huge pylons as yet another blot on the landscape, already marred to some extent by the windmills in every direction and that these new lines would be merely for transportation of energy to other areas and would not provide any power locally at all. They do not believe that any jobs will be created for local people either. As the project has been declared of public interest the REE do not need to apply for planning permission at a local level. Only the Regional Government body, the Junta de Andalucia has any say at all in the proposed route. The irony is that this same authority has recently proposed the area of the Lecrín valley as an area of unique beauty and ecological value to the World Heritage site UNESCO, nominated mainly for its ancient olive groves with some of the oldest and tallest examples in the world, still cared for using ancient Nazarí irrigation channels bringing water from the Sierra Nevada. The area’s nomination has passed the first round of voting but seems set to be taken off the table should this project go ahead and its olive groves and their surroundings be destroyed. The initial lines and proposed power station are proposed for 220kV but they are being built to be able to be upgraded to 400kV in the future. Likewise the sub power station is initially projected to be 14000 m2 but the platform claims it can easily be increased in size and capacity. It is being built initially for 4 lines but REE has plans to upgrade this to 14 lines in the future. The platform claims that the strategy of REE in this project has been underhand in its procedures by separating and staggering the planning submissions for it. Last year they applied for and received permission from the Junta de Andalucia for the installation of one high tension line from Benahadux to a point in the middle of the Lecrin Valley where no infrastructure actually exists. With this approved they then proceeded to apply for permission to build the sub power-station in the municipality of Saleres, actually just outside the beautiful village of Conchar and the other high voltage lines – El Fargue-Saleres, Saleres-Órgiva-Saleres – making a total of 4 lines so far. The high voltage lines and their infrastructure in the Lecrín Valley are supposed to be in service by 2022 and construction on the project was therefore planned to start later this year. 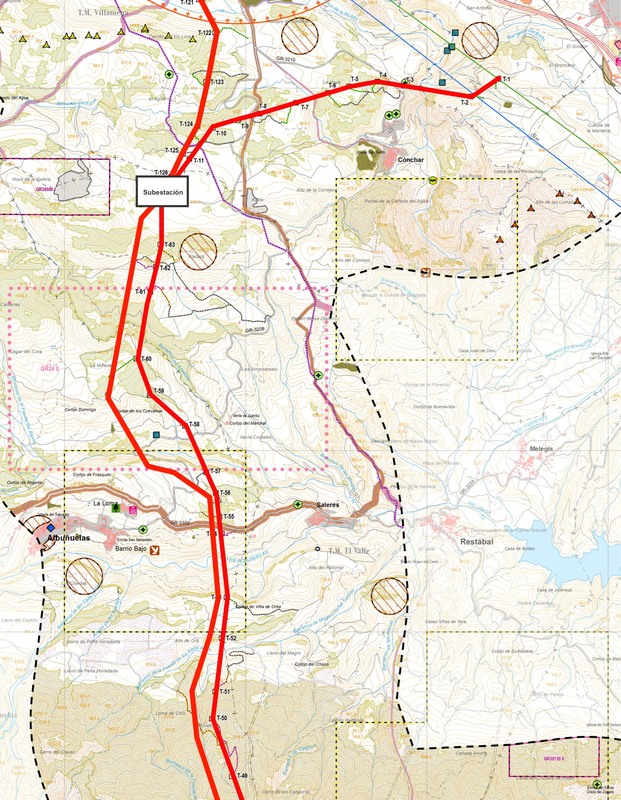 There were apparently at least 40 other routes studied for this supposedly “inevitable and unavoidable” proposed power line between Granada and Almería. They are not all available for public study and the usual research and calculations of ecological repercussions which should be attached to these projects are not visible on the company’s website – the links for said documents do not open. All alternative routes seem to pass through the Lecrín Valley anyway, either nearer or further from the villages affected most. This is because the Valley is a natural corridor between other officially protected areas designated Parque Nacional. It must be said that they are also much less accessible with their mountainous topography. In fact, in the 1970’s, a high voltage line was installed along the lower Sierra Nevada to Órgiva and it is still in use. One of the proposed alternatives suggested by the platform is that this existing line should be updated to carry the increased load and so avoid any further disruption to the Valley and part of the Alpujarras, but as this land is now classed as Parque Nacional this is now not considered possible. Another, and less visually damaging solution proposed by others is that a large portion of the line through the Valley should be installed underground. This is indeed what has happened where it passes through Atarfe, a large suburb of Granada. Although European directives indicate that underground power lines are their preferred option, REE claims that to install the line underground in the Lecrín Valley would be even more damaging to the local environment and to agriculture and in any case they claim it would multiply their costs tenfold making this not a viable option. Studies would indicate that to install the lines this way would actually only be between 3 and 5 times more expensive in the first instance and that there is ample evidence that this extra installation cost would be offset quickly in greatly reduced ongoing maintenance costs. A group of local businesses, associations and individuals including: Turismo del Valle de Lecrín, la Comunidad de Regantes de Monteverde, la Hermandad de las Ánimas de Cónchar, Architects´ studio Mirasur Proyectos, Smart Reeds, a group of experts in radiation, Professor of Economics at the University de Granada Daniel Arias Aranda, two local hotels: Señorío de Nevada y Juan Valiente Hoteles all got together and employed the Consultants Nubia. They are specialists in estimating the impact of this kind of project and the preparation of relevant arguments. One of the studies they undertook estimates a loss of 600 million euros from losses in rural tourism income in the area should the project proceed as planned. These alegaciones have been submitted to the Junta de Andalucía by Ecologistas en Acción. Prepared by the Agroecological Cooperative Hortigas, the other main alegaciones focus more on the devastating consequences to flora and fauna and other environmental impacts which would destroy the area for ever. They expose the failings and legal faults in procedures adopted by REE in this matter, their lack of transparency and their contravening other planning laws in the hope that they can beat the project in a drawn out legal battle through the National and European Courts. Of the different groups of people encouraged to sign the prepared legal arguments, firstly there are those whose property is directly affected by the proposed project. Incredibly, those whose lands and properties were listed on the project as due to be compulsory-purchased or, failing that, expropriated, have still yet to be contacted officially by REE or anyone else about it. There is still no information even about how much money the REE propose to offer these unfortunate owners or indeed how much land exactly is to be demanded from each of them. These lands and properties are those in the direct path underneath or adjacent to the power lines or those needed for the access roads necessary for their construction and continued maintenance. Then there are those whose properties and lands are to be acquired for construction of the bases of the huge pylons, some of which REE say will be up to 200m2 in area, although there are those in the platform who estimate bases of 250m2 may be necessary on some of the sites. There will of course be, in addition, an unspecified area around each site ploughed up by excavators and other construction vehicles in the process, all depending very much on the topography and accessibility of each site. This topography also dictates the distance between the pylons and so the size of each necessary to support the weight of the lengths of cables between them – from 400m and up to 800m in some places. Four of the pylons will be 79m tall, the height of a skyscraper, others smaller, but the average height of the towers in the Lecrín Valley is 56m. All other people, owners of local property, others indirectly affected by the project and local businesses are being encouraged to sign and adhere to any or all of these alegaciones or to invent their own. Another group such as doctors, lawyers and professors are being asked to sign a separate batch of alegaciones. The objection forms or alegaciones have been available and signed at the many local information meetings arranged in the villages affected. They can be downloaded from their website, printed, signed and presented personally or sent by registered post to Town Halls, the Registro de la Delegación de Conocimiento y Empleo Granada, the office of the Junta de Andalucía in Dúrcal. Check the platform’s website for their full addresses. You can of course write your own objections to the project or add to those already prepared in your own words. Red Eléctrica de España is of course throwing its huge weight to bear upon the case, has indeed set aside a part of their total budget of 105 million euros in order to have resources to attempt to overcome whatever local opposition they may find, as it always does in such cases. The company even decided spontaneously to hold a press conference in the Victoria Hotel in Granada a few weeks ago. This was its first attempt to publicise the project, far from the area it proposes to destroy and in front of a friendly audience with no local representation from the Lecrín Valley at all. There were many high powered figures from REE to show the importance of the project. Representatives from the platform Di No a las Torres were there though, even if they had not been invited to join the illustrious guest list within. They were outside, holding their well-made banners and showing their rejection of the project by their presence. For the recently formed platform it was an exciting day out and an opportunity to feel they were actually doing something visible, some direct action. They have held many public information meetings around the Valley and a large press conference of their own on 6th February in Dúrcal to present their initial findings which was attended by over 300 concerned local people and fellow campaigners from the Alpujarras. The March on Sunday 24th February was a resounding success. Paella was prepared for 1000 but in the end it was estimated they managed to feed around 1300. So many people came from all over the province to protest against the project. It is heartening to see the awareness and support growing everywhere. So many are affected, directly and indirectly, and their shock and anger is becoming palpable. With the weight of the European directives and those of Central Government behind this huge company with global interests, it seems hard to see how a bunch of local inhabitants can stop this catastrophe from happening even if they do have the backing of their local town halls. Some have already compared the battle to David and Goliath. This Development Plan for Spain follows directly from agreements signed at a much higher level – The Madrid Declaration signed on 4th March 2015 by the President of the European Commission Jean-Claude Juncker, and other leaders, since replaced – the then-Prime Minister of Spain, Mariano Rajoy, the then-Prime Minister of Portugal, Pedron Passos Coelho and the former President of France, M. François Hollande. Also present at the meeting was the President of the European Investment Bank Werner Hoyer. The aim of the Declaration was to reinforce electric connections between the countries of the European Union, allowing for the excess power produced here in Iberia to flow freely to our neighbouring countries in the EU and south to Morocco and thus allow us to reach our expected interconnectivity ratio. (this even though Spain already generates more than twice its own needs and this by mostly “clean” renewable energy sources fuelled by wind and solar installations). The European Network of Transmission Systems Operators for Electricity (ENTSO-E) is a group of 43 TSO companies from 36 European countries who are the approved companies contracted to carry out the necessary works on the European electricity grids. REE S.A. is the Transmission Systems Operator (TSO) for Spain. The European Council established in March 2002 the objective of reaching a minimum interconnection ratio of at least 10% of the installed generation capacity in every Member State. Spain is very behind its interconnectivity ratio, not even reaching 5% currently. In fact, the main problem areas in interconnectivity examined in this 85 page document, in their own words in Section 3.2 “Main Drivers”, seem to be those in the Iberian Peninsula and the low interconnectivity ratio between Iberia and the rest of the European Union is something of great concern with the situation being constantly monitored. They have been given a revised target of 15% for 2030 though the initial ideal target ratio was originally 32% for all Member States. After this meeting, the goals of the Madrid declaration were further reinforced by the signing of the Lisbon Declaration on 27th July 2018 at the Second Energy Summit. This was signed by the actual President of the French Republic, Emmanuel Macron, The Prime Minister of the Portuguese Republic, Antonia Costa, The Prime Minister of Spain, Pedro Sánchez and the European Commissioner for Climate Action & Energy Miguel Arias Cañete. Also present was a representative of the European Investment Bank, this time the Vice-President, Emma Navarro. The projects for the installation and upgrading of lines to try to increase this interconnectivity throughout Spain are proposed for all over the country and already in other areas people are forming local protest groups and organising themselves to fight proposed energy installations. Nijar, Almería, just days ago was named as one of the most beautiful towns in Spain by the Asociación Pueblos más Bonitos de España based in Salamanca. Incredibly, the people of the town are also being forced to rise up in protest against similar projects in their area. The first, to install pylons carrying high voltage cables from Nijar to Huebro, destroying the surrounding countryside and views from the town. The route is planned to pass along the stunning Valle de Huebro, especially La Ribera de los Molinos and into the foothills of the Sierra Alhamilla, all this an area of special beauty and archeological interest. The 132kV line is to connect the new wind farms to a new sub-station in San Isidro. There are 2 new wind farms planned, one in their municipality and another in the nearby town of Turrillas. The company contracted to do all the work in the Nijar area is Alfanar Power Spain S.L. with a projected cost of 79 million euros. The local platform No Torres Nijar are being supported by their local Town Hall and hope to create a more powerful platform by combining their energies with other local communities due to be affected by the line passing. This is a link to their website for more information and to support them in their cause. The 2015 Development Plan also includes updating the connections to Los Montes de Málaga and then on to Cádiz. We must watch this space for further local protests as the route of these other new energy connection projects slowly become known to inhabitants along the way.